Three Japanese organizations are working together in order to search for a cure to alopecia, more commonly known hair loss. Kyocera Corp., Organ Technologies Inc. and research firm Riken have teamed up to develop a treatment that will regenerate hair follicles and promote hair growth which they aim to be commercially available by 2020. 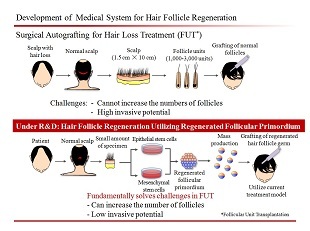 According to Japan Times, a team from Riken have already made a regeneration treatment model for hair follicles and the three firms will be developing this existing model. Under the model, hair tissues were reportedly taken from a patient’s scalp and two different cells were cultivated from these. Regenerated hair follicles from the cells were grafted back into thinning hair of patients. Riken has already been successful in regenerating body parts in mice such as hair follicles, teeth and certain glands, Forbes reports. 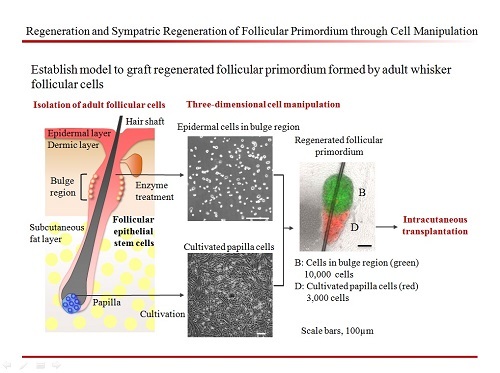 The research firm reportedly uses the primordium method to achieve regeneration of body parts, involving the use of stem cells that are capable of becoming a number of different cells in the body. Common types of hair loss include androgenic alopecia, congenital alopecia, cicatricial or “scarring” alopecia, and telogen effluvium alopecia among women. Currently, it is said that there are more than 18 million patients with alopecia in Japan alone. Because alopecia can influence the quality of life, many diverse treatments, including hair growth formulas, hair loss inhibitors and autografting of individual hair follicles, have been utilized with mixed results. Because no existing treatment —not even surgical autografting — can increase the number of hair follicles, any viable method of regenerating hair follicles has great potential to succeed where other methods fail. Forbes added that the three Japanese firms are not the first to look at regeneration to treat hair loss, as the Sanford-Burham Medical Research Institute in California had announced using similar methods earlier this year. Even Japan cosmetic maker Shiseido has teamed up with Canada’s RepliCel Life and Sciences on a regeneration method, with the goal of introducing a treatement by 2018 for a $1,000 cost. At present, the most common treatments for hair loss are the use of hair growth tonic and hair transplants, reported Nature World News. Still, the report said that there are around 18 million people in Japan who are living with hair loss and in the United States, the people who are experiencing hair loss are three times greater in number, the majority of whom are males.